The poseur table is a tall aluminium table with a high polish finish that is suitable for both indoor and outdoor use.The aluminium poseur table and chairs will allow your guests to relax and have a pre dinner drink! 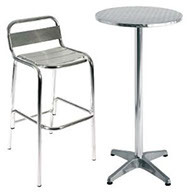 These are great for break out areas and bistro areas. The poseur table can be for hire on its own, or you can hire it with the chair.